These flannel jerseys are warm but there is a deeper meaning behind them as well. EAGLE RIVER, Wis. — On a bitter cold weekend in Eagle River, Wisconsin, a group of pond hockey players seem unfazed by the elements. "Doesn't matter how cold it is, doesn't matter who's playing," a player dressed in a flannel jersey announced. An arm patch on the sleeve reads, 'Flannel Check.' The dozen players wearing them are one of the 280 plus teams that have made the voyage into the Northwoods for the 2019 USA Hockey Pond Hockey National Championships. The flannel jerseys help keep the players warm, but they also serve a greater purpose. "Since it's Flannel Check week," we thought we'd wear flannel shirts this year instead of jersey's and change our name to Team Flannel Check," Green Bay native Neil Vanderveste explained. Never heard of Flannel Check Week? Started back in 2008, the awareness event reminds people to be proactive about their health and seek early detection of treatable diseases and cancers. "Breast cancer has a pink ribbon, colon cancer has a blue ribbon, all these different disease states have different colors to represent their disease," Vanderveste said. "With a flannel shirt, we get all these different colors representing the need for everybody to go in and get checked for early detection for preventable diseases." As for the hockey itself, the local guys are making quite a name for themselves. "3-0!" fellow Green Bay native Chris Scheer said of the teams record so far. The grand prize for winning the championship of your division? "I have no idea," Scheer laughed. 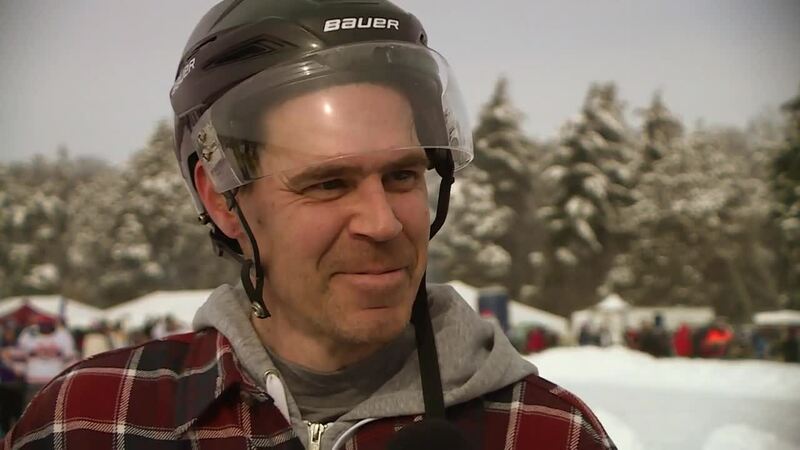 You can't cure the deranged hockey player willing to play in the sub-zero temperatures. But you can cure many diseases if detected early so don't forget to ' Flannel Check ' yourself!